bar none group: W.H. Auden's Elegy for J.F.K. 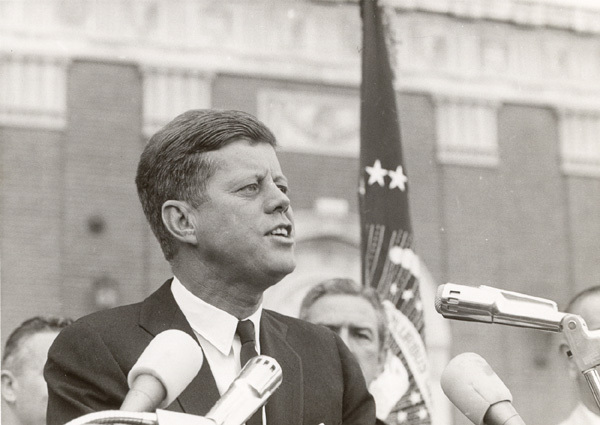 President John F. Kennedy gives speech in Fort Worth, Texas November 22, 1963. A nation mourned on November 22, 1963. It's been said that out of great mourning comes great art. W.H Auden's Elegy for J.F.K. is a testament to that. Comprised of four haiku stanzas the elegy was written at the request of the composer Igor Stravinsky in 1964 for his score of the same name. While Auden's verse is only four stanzas in length, Stravinsky repeated the first stanza at the score's conclusion. Sorrow and joy, are one. Why thus, we cry, did he die? Enough ink has been spilled over the ensuing 50 years as to the events of that day. The collaboration between Auden and Stravinsky to honor a fallen president reminds us that art can be borne from tragedy. The version of Elegy for J.F.K. that appears here is as realized and performed by Stravinsky during recitals. The poem's original form can be found in Auden's Collected Poems. Labels: elegy, haiku, Igor Stravinsky, J.F.K., John F. Kennedy, W.H. Auden, W.H. Auden's Elegy for J.F.K.